Join us in a evening of graphic scores and free improvisation. Earle Brown, Isael Huard, Rio Houle, Greg Mulyk and Emily Casavant. – Malaya Bishop, Throat singing and other delights. – Ashley Weckesser, Cello and surprising hits. – Jackson Hunter, Percussion and found objects. – Rio Houle, Drumming things and maybe piano. – Greg Mulyk, Violin and electronics. – Sean Borle, Djembe and something else. – Thomas Woodrow Martin, Clarinet and surprises. – Nico Arnáez, Double bass and mallets. Doors 6:30, concert at 7:00. Convocation hall. Entrance by donation. Monday, Dec. 11. University of Alberta. Mark Hannesson will present on the music of the Wandelweiser Collective. The program for the “Birds of Paradise Tour” is drawn from and expands upon the critically acclaimed album Israfel, which was released by Paolo Bortolussi on the Redshift label in the spring of 2016. 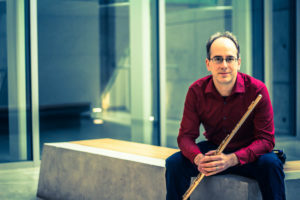 The album led to two nominations at the Western Canadian Music Awards: Composition of the Year for John Oliver’s Birds of Paradise Lost, as well as Classical Artist of the Year for flutist Paolo Bortolussi. The four works on the album highlight the spectrum of possibilities and challenges that have taken place in the world of electronic music. The earliest work, Israfel (1987) by Larry Lake, is a beautifully evocative work for amplified flute and tape, with no enhanced level of interactivity between the player and the electronic medium. Kaija Saariaho’s masterwork for flute and electronics, NoaNoa, creates 63 pedal-controlled electronic events that combine live processing of the flutist’s sound with electronic sounds and events. Keith Hamel, in Krishna’s Flute, takes this interaction a step further, where the computer tracks the flutist’s performance and adjust its timing based on what is happening in real time. Electronic events – be they live processing events or electronic sounds, can adjust continuously and vary in each performance. In John Oliver’s Birds of Paradise Lost, almost all of the electronic sounds are generated from the performer’s first few measures, in real time. The work unfolds with varying degrees of interaction between the computer musician processing the live sound, looping and playing back altered versions of it to interact with the live performer. On this tour, we will add Elainie Lillios’ Among Fireflies, for alto flute and electronics, which combines elements of live performer/electronic media interaction with improvisation pyrotechnic virtuosity! While these works present a fascinating study of how performer and electronic media have interacted and continue to evolve, the pieces in their own right are lush, romantic, beautiful works, and together create a very satisfying program. Welcome back! The 2017-18 academic year starts Sept. 5, 2017! Welcome back to a new academic cycle! This year we are launching this new site intended to encapsulate all of the information about composition and sonic arts at the University of Alberta, for both current and prospective students. While we will strive to keep this site updated and informative, please refer to the official music department pages for up-to-date information about our programs, auditions, etc. This site is meant to summarize those things as much as possible, as well as providing a quick snapshot of our current year’s activities. Please note: all dates for student concerts and events are listed in the sidebar. Please check this site often for updates and reminders! See the silly graphic at the top of the page? If anyone has better ideas – we are initiating an informal competition to create a graphic for this page that represents what we do here. So, if you have ideas, send them to Scott Smallwood. We are looking forward to seeing you all, and hearing your great new music!! Posted in Uncategorized	| Comments Off on Welcome back! The 2017-18 academic year starts Sept. 5, 2017! Welcome to the new website for the University of Alberta’s programs in new music composition and sonic arts! The purpose of this site is to provide general information about our programs in composition, as well as providing current students with information about the current year’s activities. We will also use the site to showcase outstanding student work, including sounds from original compositions and contemporary music performed by our students.